Pamela Dalton's Scherenschnitte have delighted collectors worldwide for almost twenty-five years. Her work is created in the tradition of early American paper cutting popular in the Pennsylvania Dutch regions of this country in the early nineteenth century. Dalton's original designs are influenced by popular historical themes: patriotism, biblical and religious motifs, and scenes from rural life. Each piece is sketched freehand by the artist and then cut by hand, so no two are exactly alike. Each work is cut from a single piece of paper and frames in a false grain frame. Personalized and custom pieces and unique one-of-a-kinds (often in antique frames) are also available. Please inquire. 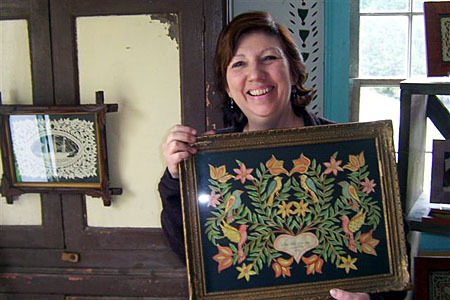 The images shown in the Gallery pages represent a selection of many of Pamela Dalton's popular designs. Because each piece - and frame - is made by hand, there will be slight variations in detail.